Mogami GOLD INSTRUMENT-RR Guitar Pedal Effects and Instrument Cables provide crystal-clear tone and a drop-dead silent background. The top choice for wiring professional recording studios for decades, Mogami Gold Instrument Cables exhibit amazing clarity and preserve the unique personality of your instrument and effects. Engineered for the highest level of transparency, Mogami Gold Instrument Cables are constructed with a conductive polymer sub-shield, an Ultra High Density (UHD) spiral shield, and an oxygen-free copper (OFC) core. For musicians on the move, Mogami Gold Instrument Cables are also designed with a carbon impregnated PVC anti-static shield layer to prevent all handling noise. Wired with Mogami Guitar/Instrument High Impedance Cable, Mogami Gold Instrument Cables feature high definition sound ideal for use with acoustic guitar, electric guitar, bass guitar, keyboard, pedal effects, and other unbalanced instrument cable applications. Mogami GOLD INSTRUMENT-RR Guitar Pedal Effects and Instrument Cables are available in 6, 10, and 18 inch lengths as well as 2, 3, 6, 10, 18, and 25 foot lengths. Mogami Lifetime "No Excuses" Warranty: all brand new Mogami cables include Mogami's Limited Lifetime "No Excuses" Warranty to the original purchaser and are proudly supported by Mogami and their dedicated network of Authorized Resellers. Please reference the entirety of Mogami Cable's Limited Lifetime "No Excuses" Warranty specification for complete details. Mogami GOLD INSTRUMENT-RR Guitar Pedal Effects and Instrument Cables provide crystal-clear tone and a drop-dead silent background. 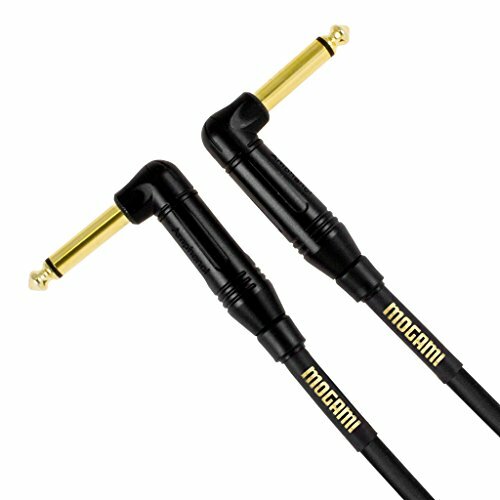 The top choice for wiring professional recording studios for decades, Mogami Gold Instrument Cables exhibit amazing clarity and preserve the unique personality of your instrument and effects. This Mogami GOLD INSTRUMENT-0.5RR Guitar Pedal Effects Instrument Cable is a 6 inch length. The Mogami GOLD INSTRUMENT-RR Guitar Pedal Effects and Instrument Cable series is also available in 10 and 18 inch lengths as well as 2, 3, 6, 10, 18, and 25 foot lengths. Mogami Lifetime "No Excuses" Warranty: all brand new Mogami cables include Mogami's Limited Lifetime "No Excuses" Warranty to the original purchaser and are proudly supported by Mogami and their dedicated network of Authorized Resellers. Please reference the entirety of Mogami Cable's Limited Lifetime "No Excuses" Warranty specification for complete details. If you have any questions about this product by Mogami, contact us by completing and submitting the form below. If you are looking for a specif part number, please include it with your message.